Dance art in Bandung has less lively atmosphere than other cities in Indonesia such as Jakarta, Jogja, Solo, Padang. It’s easily noticed, for example when there’s an event or festival on a national or international scale, Bandung isn’t counted in. The event starts in Jakarta and departs to Central Java without stopping by in West Java. There are many reasons for why this happened. Dance art in Bandung has been walking in a bit slow motion if compared to other fields of creative arts such as fine arts, music, fashion, design, or culinary. However, a new fascinating medium has emerged since 2013 initiated by group or individual including One Dance Academy, Sasi Kirana Dance Camp, Inspyro Moves, Bandung Dance Collective. They work outside the established dance communities with the engaging visions, missions, objectives, and segmentation. Inspyro Moves initiated by Jessica Christina offers a newness which may have been a long-sought among other dancers in Bandung. 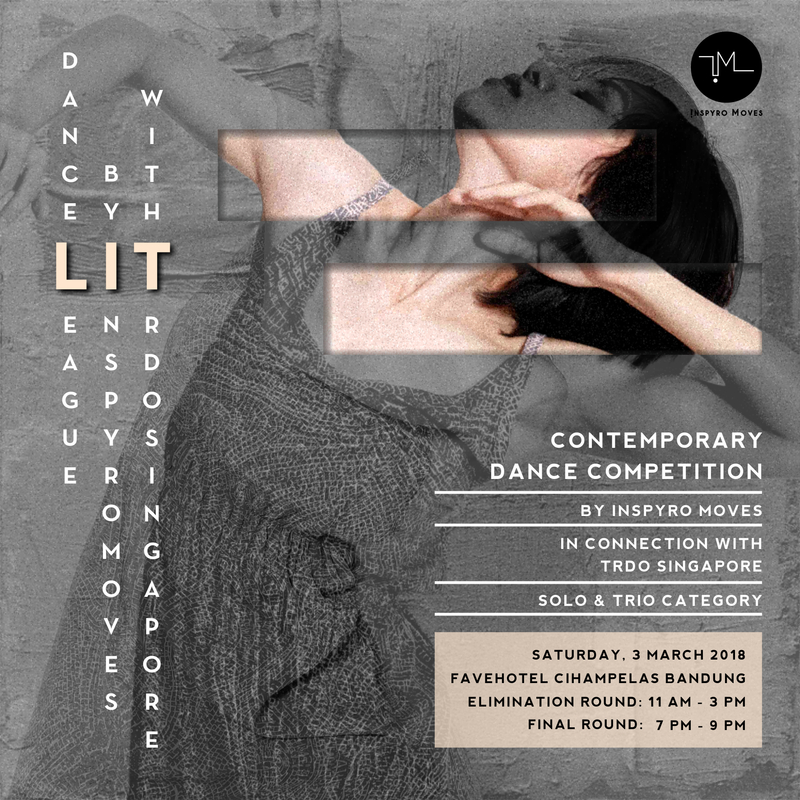 Over time, Inspyro is able to gather the dance artist and enthusiasts, not only in Bandung but also in other cities. Jessica tells her dream through the medium she created. What is Inspyro Moves and what makes it different from other dance platforms that have earlier existed in Indonesia? Inspyro Moves is a medium for Indonesian dancers to increase insights about dance art, making acquaintance and building inter-city network with dancers to inspire each other in order to support the dancers in Bandung and Indonesia. At the beginning, I particularly focus more on the continuity of contemporary dance art which I have consistently studied during my dancing activities in Singapore for years. What makes it different to those already exists in Indonesia, to be honest, I have never thought to be different from the others. I only focus on my yearn for sharing through experiences and anything inspiring for other dancers in Bandung and Indonesia. The structure and form of Inspyro Moves’activities are still evolving, tailored to what dancers, public, or cultural needs. And I still have limitations in terms of time, place, connection, fund, etc. What is clear, I want this medium is open to the public without any discrimination based on their dance studio, group, experience, or city-based. I want this medium to be the place where dancers with diverse experiences and backgrounds come together, know each other, share, exchange ideas, learn, get insight, inspire each other, and maybe work together eventually. Why did you establish Inspyro? What’s your objective? I come from Jakarta and have been so involved in dance art since I was 10 years old. I continued to study dance at LASALLE College of the Arts in Singapore. Two years after my graduation I got a teaching opportunity at O Oschool and some universities (dance extracurricular program) and then I joined T.H.E Dance Company as a full-time dance artist and do several tours abroad for our performances. In 2014, I got married and moved to Bandung. As many experiences I’ve passed, I was longed for sharing with dancers in Bandung (especially because I live here) and in Indonesia based on my experience I’ve ever had. I thought this medium can serve as a valuable learning process for them although they might not have a chance to pursue dance art abroad. I hope we can share the experience through Inspyro Moves. I want to introduce contemporary dance to more dancers and public in order to grab people’s interest and appreciation towards this art. In what kind forms of activity? > Workshop. We invite international or national teachers/choreographers who possess an extensive experience in the dance art, style characteristic or uniqueness and potential to be the inspiration for the dancers who will attend the class. > Secondly, dance intensive. Held for a small group of dancers (selected through online audition) to undergo an intensive training for 4 days in a row and perform at the end of the program. > Thirdly, dance competition. 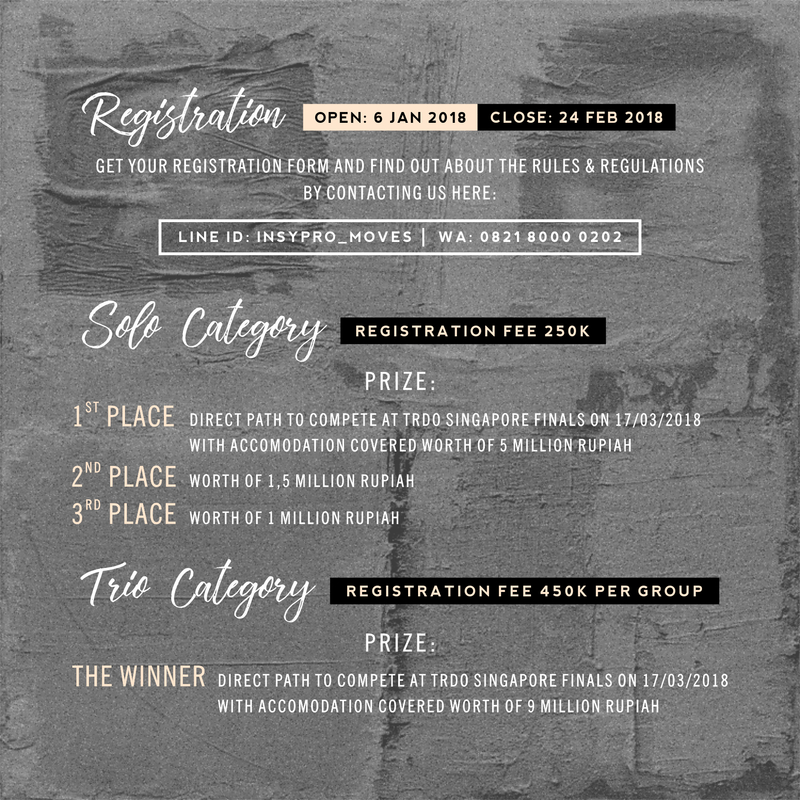 Inspyro collaborates with TRDO (The Royal Dance Off) of Singapore to search for the 1st winner who will be sent to Singapore (full accommodation)and compete with other dancers from Singapore in the final TRDO Singapore. > Occasionally we also held sharing session that involves independent artists so that they can share their technique/belief/style in contemporary dance. > I also intend to hold a regular foundation course, but it has just run for 1 cycle and I found out that I am pregnant, so it hasn’t yet run to the next cycle. Who does Inspyro collaborate with? So far, since I have built a broad network in the field of dance when I was based in Singapore for 7 years, so many teachers from Singapore are invited. They are those I know or know enough, or whose work or dance class I’ve seen before. Some of them are lecturers at The Royal Dance Off, Sigma Contemporary Dance, and Soul Signature. And also in our country, I found out some independent artist who, in my opinion, has a uniqueness and something that can be shared and inspire the dancers here, such as Moh Hariyanto (Hari Ghulur), Gianti Giadi, and Alisa Soelaeman. Surely in the future, I hope to invite other artists both from home or foreign country and from other art forms to collaborate with. How long Inspyro has been established? What does Inspyro hope in the future? If God wills, next mid-year Inspyro Moves will have a permanent studio. So in addition to the events we normally do per 4 months, I plan on opening regular open classes and foundation courses, as well as some other programs that I hope to be a very useful medium for dancers in learning, brainstorming, and sharing. I hope Inspyro Moves Center can be a pit stop for dancers from various cities in Indonesia who come to get insight and to build, inspire each other so that the dance art in Indonesia continues to grow and goes international. Are you the owner, founder, and also the facilitator? Yes, I am. For the recent first two years, I have executed events assisted by volunteers who I’ve known and I approach them to help the implementation of the event. Probably because I prefer to start with small steps, and do what I figure out to happen so it feels more comfortable to run solo first as long as possible. When Inspyro has already a fixed studio, more activities, and bigger events, of course, I must have a core team that will help me with ideas exchanges on potential projects and also work on our planning there. Where do Inspyro’s activities take place? We have used some places for the dance studio during the workshops (in Pungkur, the old studio of Bridge Dance Academy studio, Burangrang, the VIP Karapitan studio). And for the performances, we held them at Spasial and IPC hall Favehotel Cihampelas. Which dancer segmentation does Inspyro want to embrace? Are children included? I was initially yearning for embracing young dancers around 12-25 years old in order to equip them pursuing their dance career in the future, but then I realized that out of this segment, there are many people want to know and learn about contemporary dance. Apart from their interests are just for hobby, having fun, or learning, I miss to invite many people without seeing their age. So far, based on the crowd, they who follow the workshop are about 10-40 years old. And I welcome all ages to learn, as long as they feel strong and capable enough to follow the class. For the children, I actually have time to carry out 3x workshops specifically open to 8-14 years old. But the response is no longer good, perhaps because the parents prefer their children to attend regular classes rather than just a workshop. So the next time we have a fixed studio I’ve planned to have a foundation course for teenagers for 8-year-old or above. It’s still a plan. Will Inspyro only focus on the contemporary genre? Why? Initially, I focused on the contemporary since I have been studying this genre for a long time and I felt that there are so many things of the contemporary genre to learn or dig out. And also because this genre is still rarely known, studied by dancers or people in Bandung/Indonesia so I think it could be a kind of awareness so that they want to know and appreciate this genre. Of course, I am very open to other genres as I fond of ballet/hip-hop/jazz. Inspyro also has started to introduce street jazz and hip hop this year and got a very good appreciation from the dancers. So, in the future, we’ll see how to include other genres, but I think we’ll still focus first on the contemporary genre since this is a genre I am passionate about and I yearn to pursue and introduce more. Join and witness a contemporary dance competition hold for the second time by Inspyro Moves. Why Bandung? What are issues on performing arts in Bandung and What kind of the role does Inspyro expect to do? The main reason because I am married to a man from Bandung, now I live in Bandung and take care of children as well:) We can for sure work on collaboration in other cities later. But now I want to build a foothold first in the place where I live until it gets strong enough, thereby I also do not need to travel constantly when teaching or holding an event. Honestly, I haven’t really explored the dance art in Bandung since my network is still limited. What I have done so far is to apply what I know and what I want to share step by step. I certainly yearn to gradually be involved and make acquaintance with experienced people within the art performance in Bandung, so that we can exchange our ideas, inspire each other, work together. I think Inspyro alone can bridge people with limited knowledge and interest in the art to begin to recognize and appreciate art in Bandung, started from the dance. Because not many people may understand or want to see something abstract rather than the interesting or entertaining ones. I hope through Inspyro, we can present a balanced combination in order to gain people’s interest in knowing and appreciating art. Is there enough infrastructure for performing arts in Bandung and what remains urgent to be provided? I wish Bandung have theater/black box with international standard facilities and equipment. Thus, the artists or guest performers from abroad can have a comfortable and conducive platform so that they can maximally display their work with all the creativity. It will also encourage the audiences to witness the art performance and get their imprinting experience. Secondly is a dance studio with a large scale and international standard (flooring and room) thereby we have comfortable and conducive facilities while we hold the workshop. And also we wish to invite teachers from abroad. I think when there are adequate and excellent facilities, many people will get interested and willing to come/support/get involved. Have you ever thought of working with the campus? If not, why? Honestly, I haven’t, maybe because I have no network that connects me to the teachers or members of the campus in Bandung. So far I’m still focused on opening a public event, it’s open to the public, for anyone who gets information about our event. Surely if in the future there is an opportunity to cooperate with the campus, I would gladly be involved as long as I can meet the schedule and the project meets Inspyro Moves’s ideas.